There really is no place like home, and the homes that we live in are reflections on who we are as families, couples and individuals. Our sofas, carpets, flooring, rugs and all the little interior details are what we use to make a house our own and really put our own personalities into our properties. 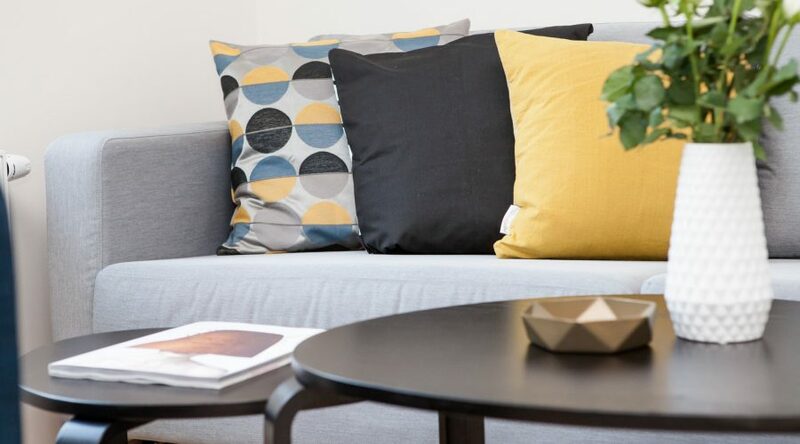 But, whether you choose to live in a cosy, compact and traditional home or you prefer your interior to be modern, stylish and sleek, there’s one thing that we can all agree on, and that is: our homes should be nice and clean. A clean, hygienic and tidy environment is much more pleasant to live in than a messy and dirty one. On top of that, visiting your home is hardly pleasant for your guests and visitors if your carpets, rugs and sofas are stained and grubby. A clean environment is also important for our health, with dirt and dust attracting organic growth and dust mites – both terrible for people with allergies and asthma. At Bailey’s Floor Care, we provide domestic cleaning services of the highest standard, ensuring you, your family and your guests can live in a clean and healthy environment. By cleaning your rugs, carpets, floors, sofas and other furnishings using professional cleaning equipment and products, we’re able to completely restore your home’s interior back to a brand new state. A thorough clean every now and again can go a long way, with one service massively extending the longevity of your belongings, meaning you don’t have to invest in new furniture or flooring for a much longer period of time. And, unlike other cleaners in Derby and Leicester areas, we provide a 100% Money Back Guarantee on all of our services as part of our commitment to customer satisfaction. So, if you’re in any way dissatisfied with the results we produce, let us know and we will re-do the job for free. If you’re still not happy, we will provide you with a full refund. So, what can we do for you? When you choose Bailey’s Floor Care as your carpet cleaning company, you’re choosing to benefit from nearly 2 decades of professional carpet cleaning experience. That’s right – on top of our extensive training and qualifications – we’ve been providing professional carpet cleaning in Leicester and surrounding areas for 18 years now, successfully restoring carpets for thousands of homeowners and businesses. Using a detailed step-by-step carpet cleaning process that we’ve developed over the years, carried out using the best carpet cleaning equipment available on the market, we’re able to completely restore your carpets, leaving them looking brand new in just one service, no matter how old, dirty or stained they’ve gotten. Holding accreditation from the IICRC (Institution of Inspection Cleaning and Restoration Certification), you can rest assured that when you choose Bailey’s as your local carpet cleaners, you’re going to be provided with nothing less than a first class service, and on top of that… you’re going to see great results. Your rugs are also in good hands with the team at Bailey’s Floor Care. Unlike other rug cleaners in Derby and Leicester areas, we choose a rug cleaning process that is specific to your rug type. That way, we’re able to thoroughly clean and restore your rug without running the risk of damage, such as shrinkage or colour-run. We’re able to collect your rug from your property, before thoroughly restoring it using a 6-step rug restoration process that guarantees incredible results every time. Then, when we’re done and your rug is clean and dry, we will return it to your property at a time that suits you. Rug types that we’re able to clean and restore include Turkish, Moroccan, Pakistan, Indian, Afghan, Persian, Kilims, Chinese and silk. If you have another type of rug or you’re not sure what yours is exactly, get in touch and we’ll let you know! As well as your carpets, we can also fully restore your hard floors, which can become scuffed and scratched over time. We’re knowledgeable in the complete restoration of a wide range of hard flooring, including Marble, Limestone, Terracotta, Granite, Slate, Travertine & many more. Theses stones make beautiful flooring, but must be maintained carefully, using the correct equipment and products. Cheap, store-bought products and incorrect cleaning equipment can do more damage than good over time, which is why we’re very particular about how we treat stone floors. Like stone floors, wood flooring can become scratched, scuffed and marked over time, especially in high traffic areas like hallways and kitchens. Bailey’s Floor Care is a Pallman Parkettprofi Certified Contractor, so we exclusively use the Pallmann range of wood floor sanding products when carrying out our work. We also provide a 2-year warranty for the service, which is backed by Pallmann Parkettprofi through The Ultimate Floor Sanding Company affiliates scheme of which we are proud members. Sofas, armchairs and even curtains can very easily become darkened by dust and dirt over time, with seating furniture also becoming a victim to colouring stains from clothing. Our technicians take on a careful, yet effective approach to cleaning your upholstery. As well as cleaning your soft furnishings using fabric-friendly restoration methods, we also offer invisible anti-stain protection, which will massively reduce the chances of spills becoming hard-to-remove stains. The outside of your property represents you and your family just as much as the inside does, which is why we feel it’s important to keep it clean and tidy, too. Using powerful outdoor cleaning equipment, our technicians can thoroughly remove dirt, moss, algae and other organic growth from your block paving, decking, patios and driveways. So, if you live in Derby, Leicester, Nottingham, Warwick or Northampton and you’d like to receive a quote on one of our cleaning services, get in touch now by calling us on the number above or sending us a message using the quick and easy contact form on this page. Efficient and friendly. Good as ever. Your company did an excellent job cleaning a heavy solid rug. I could not believe it was the same rug when it was return. Very satisfied. Good job, very well done and reasonable price. Excellent specialists with a great attitude and work ethic. Very professional in every way. Punctual, courteous and very good. First class family run business. Pleasure to deal with. Richard and his colleague have done an excellent job on my floors. Thanks guys. First class service. Spot on with job done better results than expected. An experienced and professional company who make all honest assessments of the job. Very good service and performance. Very good work would use you again. Excellent service and a good job well done. Efficient and good value for money. Fantastic job and very friendly. Positive, I was very pleased with all aspects of the service. The Turkish rug looks perfect and very clean after 30 years. Good professional service with explanation of how the work would be carried out. Cleaning done efficiently by the technician and to a high standard. Very pleased with the results. Very professional and informative, We are very pleased with the overall job. Excellent value for money. The technician was very efficient. He also spent some time in explaining how I could keep the carpets looking good. All aspects professional from first visit to quote to completion of the job. Professional and excellent service. I will certainly recommend and use your services again. Excellent and very knowledgeable about the product. Very professional and competent throughout. Professional, fantastic attention to detail, polite and they worked very hard. Extremely pleased with the results. Our beautiful parquet floor is full of life that was hidden under stains and sixty years of grime. Thank you especially to Richard for his professional and informed approach. Excellent service from start to finish. Courteous, knowledgeable and professional staff and a job very well done. Excellent company care. We will use you again and let friends know how good you were. You do what you say when you say. Fantastic, carpets loo almost new. Very impressed, clear explanation of the work and a timely return of the rugs, within the expected 2-3 weeks. Polite, on time and sensible price. Great job done, really satisfied. The work completed was excellent, no dust and helpful technicians. Good, reliable gives excellent value for money. Very good service and great cleaning. Very good from start to finish. Very experienced people and technician really knew his job and cared about the job he was doing. Extremely positive. Would recommend your company to anyone. Very professional, pleasant, hardworking friendly men. Delighted with the results. Excellent work. Floor looks like new. Hope the finish lasts well wit heavy usage. Excellent will always deal with you for my cleaning needs. Very good made a good job on my carpets which were very dirty. Completely satisfied with every aspect of the work. A great result. A professional well organised company. When we read the advertising leaflet we thought, “if this company is as good as they say they are its exactly what we want”. They were every bit as good! We are extremely pleased with the amazing results and fast service. Professional company, a good job done. Very professional and efficient. Technicians friendly and helpful. Excellent time keeping. Our first time and will not be our last. Professional, efficient, friendly, knowledgeable and informative. Very professional service - our Travertine floor really looks like new and the technician took pride in doing the best job he could. A very professional service, very clean and tidy work methods. Nothing was too much trouble for Jordan the technician. Efficient and effective. We are very pleased with the end result. Very good would recommend you to anyone. Excellent company which I will use again and recommend. Very satisfied, good results, carpets and rug look much renewed. Very professional, the whole team seem to know what they are talking about. Very good. Have already recommended your company to a neighbour. Very efficient and professional. Process and expectations fully explained. They honored their promotion despite our lounge being larger than expected. Thorough job done, friendly staff. That they are professional, efficient and so trustworthy. A very thorough service, helpful and courteous. I was very pleased. Made no mess and was a very hard-working man. Feel secure in the knowledge of an excellent service from a courteous helpful professional and flexible staff. The technician who came to clean my patio and paths this month proved that my faith in the company was justified. This is the best I have ever had my carpets cleaned, also I had the 3 piece suite cleaned. Everything looks like new again, especially the carpets. Professional company who were very knowledgeable and helpful. We didn't think the tar stains in our new cream carpet could be cleaned but you did it. Thank you. The service that you gave was out standing. You were efficient, effective, helpful and totally co-operative. Thank you for doing such a brilliant job for us. I have been very impressed. The response at each stage has been very prompt, professional friendly. An excellent job was done. Arrived on time, job completed on time with no mess. Thank you for the excellent work carried out to renovate the main hall at Weston Village Hall. I would like to say how impressed we have been with Richard’s work and the professionalism he has demonstrated whist undertaking this project for us. Thanks also for Jordan’s assistance, the finished levels they have achieved are truly appreciated. I will have no hesitation on recommending your company to others who are considering floor work at their homes and community halls. We think the service is very good and have been very satisfied with the cleaning up to the present. We do recommend you to our friends and family. Our three piece suite has come up like new. I had a rug cleaned, did not meet any technicians but the contact I did have with the owner and any staff I found courteous and pleasant to deal with. Excellent and sensitive to our needs. We all very pleased with the cleaning of the rugs. A little note to express our sincerest thanks for the excellent job your employees did cleaning our sofas and footstool. We truly could not believe the finished result – it looks 10 years younger (shame it can’t do the same for me!!! The gentlemen who came were professional, efficient and polite. We would have no hesitation whatsoever in using your services again and also recommending you to friends and family. Very good results as before. Thank you. Your cleaning company is very professional and thorough. I was very pleased with the results. Excellent, professional and knowledgeable. Will use again and recommend to others. Arrived on time and did a very clean and tidy job. The Suite was cleaned brilliantly. We would recommend the company to our friends and neighbours. You do a competent job and very friendly company. Your technician was courteous and really friendly. I felt safe which is a massive plus when living alone. This is the second time I have used you and on both occasions I found the service and workmanship to be first class. Very professional and efficient company. Very friendly but straight talking. We are very impressed Thank You. Excellent service, very reliable. We've used you before and we will again. You know you are going to get the service you require. Quick and efficient service with excellent results. Everyone I met was friendly and very helpful. Excellent service and end result as promised. All staff very professional and answered all questions, very helpful. We are thrilled with the appearance of our wooden floor. Completely rejuvenated, looks like new. Excellent service, good value, polite friendly people. Very professional Jordan and Richard excellent work ethic self-motivated two hard working lads nothing was too much trouble. Very professional, efficient, courteous and did what others told us could not be done. Our wooden floor looks fantastic at a very good cost. Thought I would let you know now how extremely pleased my wife and I are with every aspect of the job. Jordan and Richard were both highly professional, clearly knowledgeable and experienced and I believe have a genuine pride in their work - as they should do!! Please thank them again for us. The finished floor itself is almost beyond description, far exceeds our expectations and should be viewed as a work of art, never to be walked on!! As I said to the chaps yesterday, I cannot recall the floor ever looking as striking, even when newly laid by my father 45 years ago! I would have no reservations to recommend you to others and you would be our first go to company for any other future flooring works. Quick and efficient. A good experience. I've recommended you to my daughter-in-law. Chris was quick, efficient and explained what would happen. Bailey's is a well run company. Very professional, knowledgeable and helpful from start to finish made the process as trouble free as possible. Roger worked tirelessly for 9 hours. Excellent. Arranged the visit at very short notice to suit the situation as urgent. This company have set the benchmark for others to aspire to. An absolute pleasure to do business with from start to finish. Courteous, punctual and skilled at what they do. Highly recommended. Helpful and very informative. Will always use you. I felt that you were a trustworthy firm, from my first meeting with you and I like the way that you explained all the options and processes. The fact that we have used your services on three occasions tells all you need to know! we also recommend you to others. A very good job is done by a pleasant technician in a professional manner. Very pleased with everything. Very good, no hassle got the job done in the time, no mess, everything went smoothly. Very good - Otherwise I wouldn't have used you for a second time! Excellent service, friendly, efficient. A brilliant job, the hall is so much better looking it is rejuvenated and transformed. An excellent service! Friendly and professional, my hand made woollen Turkish runner looks amazing. I’m very pleased. It is efficient, helpful and accommodating my disability very well. Very professional, helpful and offered good advice. My suite has not looked this good in years, your technician removed stains I hadn't believed possible. No need to buy a new suite now will be using you again next year. We first used your services two years ago, we would never go anywhere else now our suite looked amazing!! Great service. We’re having our carpets cleaned next. Absolutely fantastic service from start to finish, our floor looks better now than it did new. Very professional and trustworthy. We appreciated being informed etc this is the first time we have used a professional cleaning company for our furniture and we have been very pleased with the prompt attention and efficient service and the result. First class service, accommodated all of our requirements and were friendly. Excellent customer service - prompt, friendly, efficient, great value for money. Very satisfied, returning customer who will be using you again. I was very pleased with everything that was done. The technician was very nice and helpful and did a very good job. Very professional with a friendly manner. Made an excellent job of our drive. Could not fault the work. Amazing! A brilliant job done totally professional, we were absolutely delighted and wouldn't hesitate to use your company again. I would and do recommend you to everyone. Very professional, very skilled, thorough and passionate about providing the best service possible, very friendly but also very professional super impressed. Rejuvenated our wooden floor almost dust free. Fantastic services, kept me informed all the way through the cleaning process. Above and beyond services, I was and so pleased with my rug. Excellent service and staff, Bringing our old, stained floor up to new. Friends have commented that the floor has never looked so good. All of you are very pleasant, you do what you say you are going to do and all are very efficient. We would certainly recommend you to others if we were aware that they needed the service you offer. Very professional, the people I spoke to on the phone and both of the technicians that came to my house were A1. Very good pleased with the result. Very professional service, Detailed quite given with no pressure. Work carried out by Roger who was very courteous and respectful, he did an excellent job in the time stipulated. Would recommend your company. The service & standard were excellent and I could not have asked for a better or more professional job, great customer service, friendly and always a great job done. Very helpful, friendly and professional. I needed job quickly and it was done within two days. I was very pleased, you lived up to the testimonials I had read. Did excellent work and left the place tidy. From the outset we have had the very best service, on time, explained the process and estimated how long the work would take. I have used you on previous occasions and have always been very pleased with the finished standard. After the excellent job you did on our carpets we were very happy to have you back to clean our patio, can't believe how good it looks as it was filthy. Brilliant, I thought the price quote was expensive but when I saw how much work was involved I don't think it was. An extremely professional organisation yet very approachable. Work carried out in an organised manner and efficient use of time. Careful and paid attention to detail. We have used them before and would use them again. Extremely pleased with the overall outcome. Tiles positively gleam and the grout looks so much brighter. I have been very pleased by the excellent clean of my rugs. You deliver exactly what your advertisement promises. I am so impressed and pleased with the results of my tiled floors. Chris was polite and efficient when he called to give a quotation. The work was done extremely well and at the time stated. I am very happy with the results particular on the upholstery of a fabric sofa that had seen better days. Excellent service that delivered what was promised. A quick response to my query and also well done. Professional and highly recommended. Reliable and confident of the professional work quoted by the technician. The job was carried as described and results in stone floor looking almost as good as new, excellent thank you. Friendly and efficient. Will use again. Delighted with the professional service. First class service from quotation to work being carried out. I'm, really pleased with the work, especially the dining room and kitchen areas which have "come up a treat", as they say... Once again thank you for an excellent job carried out in a highly efficient, yet charming fashion. Very polite and efficient staff. Treated my home with respect. Second time we have used your company great service both times and always friendly & polite. Very professional with great knowledge put forward in an easy to understand way. Excellent service, professional & polite technician. Great results. First class job from a first class company. Chris was very good, The technician who carried out the work was excellent, polite, hard working. We hope you look after him. Professional service carried out, Very impressed. Very professional both in costing and time keeping. Extremely caring and thorough during the cleaning process, a very satisfactory result. It was excellent and we would happily recommend you to friends. Very pleased with your service and I was very impressed with the hard work that Jordan put into his work, well done! Good professional service. Appreciated the initial planning with time to talk and ask questions. Not the cheapest, but very satisfied, impress with the result and with Tom. Worth every penny. Excellent, would definitely recommend you to friends and family. This is easy. Courteous friendly and very professional. Tom explained the process on cleaning which was good and proceeded to follow that process to the letter. Excellent. Very good indeed, were very professional and approachable, especially the technician Jordan. Do good job but a little pricey. Quick efficient and friendly response to my contact. Excellent if not a little expensive. Good Quality job done. The gentleman who carried out the cleaning was an excellent worker and I would recommend the company to any one. Very good and professional with good results overall. I needed more transparency in the quotation which I received. Professional, courteous and honest. Wow was the only word we could use at the result, our rug came back to us looking like new. I’ve got a new suite and carpet, it’s absolutely marvellous the difference it has made. Tom was very professional and very meticulous to details. Very pleasant young man indeed. Roger is providing excellent service, friendly and helpful. Care and attention to detail, advise and informative. Very good and we shall certainly return to you when our carpets or suite need cleaning again. Very professional, good service quality result. The service took a little longer than the three weeks I was initially told, which was disappointing, However pleased with the service received. Professional, honest, friendly & efficient. I had to check you out to see if you are as good as you say. Yes you are! Very good service and excellent price wise rug cleaning excellent. Must say I was a little worried about having it done as friends have been disappointed with other companies, but no need to have been with you. Very efficient helpful and friendly. Very good, I have recommended you to a few people. At this time I have no complaints about the work carried out, very quick and efficient. Excellent service and very friendly. Tom was brilliant. Excellent the job was carried out in a professional manner. We are fully satisfied. Delighted with the service although my suite took a lot longer to dry than advised. Fine job done. Have nothing to compare with but you did what was promised and I am satisfied with the results. A real good job, on time and very helpful in returning rug. I would use the again and will recommend to others. If only all service companies were as competent and professional as this. Very impressed professional and friendly. This is the third time we have used you. I was that satisfied with the cleaning I have recommended the company to my friends. We thought from the beginning to end the whole attitude and professionalism was superb. The guy who cleaned was marvellous, courteous and professional. Very pleased with result, job well done. My impression is of a professional efficient company that shows care and interest in discussions regards treatments etc of carpets. An efficient and friendly company. The cleaning was undertaken with no fuss and we are delighted with the results. Very good and professional company keeping to its promises. Reliable and does a good job. Thank you. Professional & friendly & did the work exactly how they said they would and I'm very pleased with the result. Great, reasonably priced and very informative about the cleaning process, we felt confident at all times a good job has been done and the results were fabulous. Very professional. Sofa did not come up as clean as I had hoped. spots & stains were removed but the general dirty colour of some of the seating is still there. The young man could not have been any more helpful and understanding you get top marks. Your company was recommended to me by a previous customer and my dealings with you both with my rug clean and furniture cleaning could not have been more satisfactory. I can't fault you and I am delighted with my rug. Friendly helpful and on time. I would use you again and recommend you to others. An excellent company who do the job you say will be done. I would recommend your service and I feel it was money well spent. Your company is very professional. Most Impressed friendly and efficient. I was most happy & very pleased with the work done on my carpets and was amazed how well the two upholstered chairs came up as new once again considering they are. A thoroughly good job with a minimum of disruption. Tom is a very good ambassador for this company. Patio looks restored - I didn't realise that was possible! Very Impressed and have recommended you to a neighbour. Very efficient and hard working. Our carpet's and suite looked as good as new. I would recommend you to family and friends. Excellent job thank you. Well supplied and priced... Bailey's Floor Care are reliable and thorough. Very good job done. Honest assessment given (e.g.. which stains cannot be removed). The patio brickwork etc, was certainly much improved. Very impressed with quality and finish of service. I have recommended you to a friend. Excellent, should we require further cleaning, we would have no hesitation in contacting you. Very good rugs came up really well. Lovely job! We were thrilled by the way that all our carpets and rugs look like new. The service is excellent in every way. Very Professional job, well done. Very impressed with the expert, knowledgeable & helpful advise given. The service was perfect in every way. Bailey's Floor Care do exactly what they say. Very friendly & quick to respond. Everything looked great when cleaned. Excellent service. No need to look anywhere else. I was Pleased with my rugs. First time that we have used you and we will become a regular customer. Professional and reliable, good quality service. Good technical advise and recommendations of service available. Great results on both carpet and upholstery. I was very impressed with the professional way the technician "set out his stall" before he commenced the cleaning and the carpet was well covered. A quality service, you get what you pay for. I could of paid less money to another company but I don't believe I would of got such a deep clean, very satisfied. Very satisfied, sofa cleaned. No need to replace it therefore saved money. Did a good job considering the age of the suite. Well organised, professional and efficient. Very professional both people I met were most pleasant. Took care to establish exactly what was required and carried it through. My carpet looked very clean and came up like new. Very pleased with the out come. Very professional. Both the carpets and the tiled floor were cleaned to a very high standard. The rooms were left as found so I did not even have to put the large furniture back. We were satisfied with the cleaning. Very professional, couldn't fault service. We are very pleased with the work done on our carpets and chair. Very professional, very helpful, excellent job didn't recognise my rug it was so clean. Very professional, the results are first class. Your technician was very efficient and did a jolly good job. Very pleased in all aspects. Excellent, would recommend to everyone. Great service, friendly helpful technician. I am really pleased with the result. Pleased with the end result of the cleaning of the suite and carpet. Helpful friendly staff. Very friendly and professional work carried out very efficiently and in a tidy manner. Excellent. Our Marble floor looks better and is easier to clean than it was the day we moved in 13years ago. Excellent service the technician was very helpful and trustworthy. I was able to go out shopping and left them to it. Bailey's Floor Care did a very good carpet clean, also two chairs we were very well satisfied with the overall results. Thank you very much. First class will use again. We now have a beautifully restored travertine floor. Very good service, I am very pleased with the results. I was very happy with what the technician did, no more cooking smells, smells from pets and smoke smells, also very happy with the cleaning of the rug. I was absolutely delighted with the rugs after cleaning. They looked like new again. The service you have given is brilliant and will not hesitate to recommend you to people we know. Your service man was brilliant, very courteous and respectable. I have already recommended you to people. Good, clear and polite presentation when assessing the quotation. Your employee was very polite and helpful during his visit. We were very pleased with the end result. The work was carried out with efficiency and thoroughness, we have already recommended your firm to our friends and neighbours. An excellent result. The serviceman worked efficiently and cleanly, very good results. The service was quick, efficient and very pleasant. Service was good and informative about my suite. I shall certainly have future carpet cleaning done by this company. The whole room looks much brighter. Very reasonable priced and pleasant working. Goob job done. Exceptionally good. Two other companies had ago at cleaning our rug and failed. You returned it and it looked like new. Very good. I was very pleased with the results thankyou. Good service. Very pleased with the results of both carpets. Any comment would only be good. Prompt first class service and clean on our ceramic kitchen floor. Very pleased with results. Our hall tiles look brand new! Professional outfit with modern equipment. Excellent service, prompt and friendly. Thanks for the good work, courteously and efficiently done. We were impressed by your telephone information, we like to support local businesses where ever possible, Very nice, polite technician. We were really pleased with the results, it's like a new floor. Thank you. The Knowledge of staff at Bailey's Floor Care and cleaning etc gave me the confidence that my cherished rugs would be in safe hands of professionals ... and they were!